End of April: I was beaming in joy as I received an offer letter for a major newspaper company in South India, offering me a job in their editorial department. The posting was in Tamil Nadu, with training at Chennai. I decided to take up the job, and accepted the offer. I was to join in the first week of May, but certain personal commitments made me postpone the date to mid May. 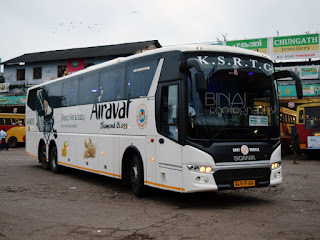 (It is a different matter that I did not join the job at all at a later stage) I had the option of taking a bus or a train from my place to Chennai – I initially planned to take the bus, but later changed my mind to take a bus due to the amount of luggage I would be carrying. I booked the ticket at the newly opened railway ticket reservation counter at my hometown, Kodungallur. I took a ticket in 2A of 12696 Trivandrum-Chennai Central Superfast – I still do not know why I booked this train. The ticket was waitlisted – WL16. Days passed quickly. The ticket did not move even a bit for about a week. Over the last one week, the ticket fell to WL15, then to WL11, then WL9 and finally reached WL4 a day before journey. I could not even try booking a tatkal ticket due to lack of internet connectivity on the opening day. May 14, 2012: The day of journey. 13:10hrs: It is exactly 4 hours left for the train to start from Trivandrum central. I anxiously checked if charting was done. The status claimed “Chart not prepared”. If the ticket wasn’t confirming, I wanted to get a bus ticket. Most buses to Chennai that evening was more-or-less full. 14:10hrs: Three more hours left. The ticket moved to WL1. Chart still not prepared. 15:30hrs: Chart Prepared. My status was now “RA1 3”. Oops! It just moved to RAC! Anyways, I can board the train, and by now preparations for the journey was on warfooting. The train would depart from Thrissur at 2310hrs. Since I am the only driver at home, a driver was hired to drop me at the station. I started from home at 2130hrs – so sentimentally charged that I could not bid bye to my mom. We reached the station at around 2210hrs – my dad, and two neighbours were accompanying me. Just as we entered the station, the Ernakulam-Guruvayur passenger pulled in with a WAP4 doing the honours. Moments after the passenger left, the Mangalore-Trivandrum Express (16348) came in with a WAP4. Later, the Tirunelveli-LTT Holiday Special came in with a Kalyan WDM3D at the helm. Behind the special was the Yeshwantpur bound Garib Rath Express, with a Krishnarajapuram WDM3A. By now, the time was past 2310hrs. I kept enquiring the status of my train through Trainenquiry, and found that my train was coming closer to the station. In the mean time, a couple of freights passed through. The PA system came alive with the typical irritating chime at around 2325hrs – this raised hopes in me. But that was to announce the arrival of the Trivandrum-Guruvayur Intercity Express. This one came behind a WAP1. My train finally came in at 2340hrs – WAP4 #22224 of Erode was in charge. My coach was the 8th from the loco – WGACCW 05051, based at BBQ (Basin Bridge Jn.) Chennai. It was hot inside the coach, and I felt things were not all-right as I got in. There was eerie silence in the coach – the co-passengers around my seat seemed very uncomfortable in their berths. I bid bye to the send-off committee at the station, just as the train got moving (2345hrs). By now, I understood that the AC was dead! There was some electrical failure in the coach, and they couldn’t switch on the air-conditioners. The TTE came around to check my ticket – the other RAC passenger hadn’t turned up and hence my seat got confirmed. He marked the seat number on my ticket and moved to the nearby coaches for checking. Coach attendants were now running helter-skelter to get the power supply restored. Finally, jumper cables were laid from the nearby coach, and they managed to partially restore power supply. The power supply was barely adequate to run one AC unit at a time (AC coaches have two units, one at either end of the coach). The supply would trip the moment they switched on the second AC unit. So finally, our fate was decided – we had to travel without AC that night. Not a great start to my journey – I rued booking the train instead of taking a bus. In the meantime, the loco pilot unleashed all the horses and we were at a fairly good speed. The train slowed down near Bharathapuzha Bridge, and then picked up speed again. The passenger on the side-upper berth near my seat was now sitting up. It was very hot in the coach – the fans were dead as well. The AC on the other end of our coach was running, but that unit could hardly pump in enough cool air to reach us. The train rolled into Palakkad, and the TTE literally ran off from the coach. The new TTE was welcomed to our coach with a handful of complaints. This TTE just ran away from the coach and settled down in some other coach. His berth (side lower berth #5) was allotted to a passenger now. The train started off from Palakkad, and picked speed quickly. I was exhausted completely, and fell asleep despite the unbearable heat in the coach. 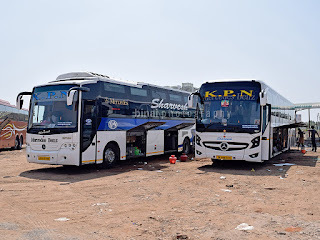 I woke up hearing some commotion in our coach – the passenger who was allotted the SLB was now sitting up and shouting at the coach attendant. The passenger on the SUB was sitting all this time. Both of them were disturbed by bedbugs! The coach had a lot of cockroaches – they were running all around, on the curtains, walls, berths and even on people who were sleeping! There were a few kids in the train, and all of them were crying for most of the time. The TTE had disappeared from the scene, while the AC Attendant was sleeping at the other end of the coach! We reached Tiruppur sometime around 0200hrs (from my vague memory). Just as the train left Tiruppur, the TTE re-appeared in our coach to get hold of the AC Attendant. It seems the AC in B2 (where this TTE was holed up) was not cooling enough – by now, my patience was running thin, and confronted this TTE. It was “cooling less” in B2, while it was “cooling nil” in A1. By now, some more passengers joined in complaining about cockroachs and bedbugs. The poor passenger in SLB #5 ran away to 3A to sleep a bit. The Attendant was not asked to find a solution to the power supply issue. By now, the train pulled into Erode. The staff took absolutely no effort to repair the power supply issue or seek assistance from the coaching staff at Erode station. The train started off from Erode after its usual 10minute halt. What disappointed me a lot was the fact that not a single passenger in the coach joined me to get the AC repaired – people were cribbing within themselves, while some people were complaining about torn bedsheets. The TTE felt that things were not alright, and he called up some officer in Salem division (at 3 in the morning!). That officer spoke to the Coach attendant and they discussed some idea to solve the issue. The AC at our end of the coach was now switched on. The AC was at full blow, and it was dead cold in the coach now. I was now terribly tired, and just fell asleep. I do not remember seeing Salem station – woke up just when we were departing from Jolarpet. I barely had any energy to get up – just fell asleep again. I woke up a while before reaching Katpadi, when Jayasankar called me to know the status of my train. A lot of unreserved passengers got in to the train at Katpadi – the TTE refused to allow anybody in our coach. The red-eyed, sleep-deprived TTE was not in the best of his moods. The coach attendant was now running the AC at either ends of the coach alternatively. I decided to call off my sleep and got off the berth. Since power supply was partially up and running, water supply in the coach was restored. The only catch is that it would work only at the end where the AC is running. The train picked speed soon after leaving Katpadi. 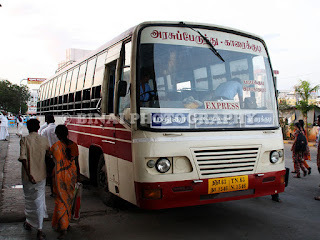 This was my first journey in the Jolarpet-Chennai section during the day time. But the incidents of the previous night drained all the excitement of the journey. And, yes – I too was attacked by bedbugs, but to a lesser extent as compared to the unlucky passengers in the Side-lower berth. We stopped at Arakkonam briefly (it’s a scheduled halt). I got my breakfast after Arakkonam – the only good part of the journey was this. The breakfast (idly-wada) was seriously good. The progress slowed after Arakkonam – we were riding yellows for quite some time. We slowed at Perambur, but did not stop. We lost all the steam after Vyasarpadi junction. The train almost stopped at Basin Bridge – quite a lot of passengers got off here. We did not stop in reality, but crawled through at walking speeds. I curiously looked at BBQ Trip shed for WAP-7s, but there were only WAP4s everywhere. We pulled into Chennai Central (I did not see which platform where we on) at 0935hrs – a full 15 minutes before time. Jayasankar was waiting for me at the station – thanks a lot buddy. There ended a journey that I would love to forget at the earliest. This awful experience makes me averse to trains further – the bus would’ve taken me to the city earlier in better comfort. Southern Railway has stopped to its lowest cleanliness levels in recent times – once rated the best, BBQ is now very bad at maintenance. This indifferent approach by the railways (whichever zone it is) is only fueling the shift of passengers to the roadways. Buses have taken over the scene in many routes now – while wider roads seeded the shift, the railways have nurtured it. Did you get any refund or so regarding the AC malfunctioning?